Steven Currall speaks in Tampa Friday shortly after being voted the next USF System president. Currall joins current USF President Judy Genshaft in raising the bull sign Friday on the USF Tampa campus. 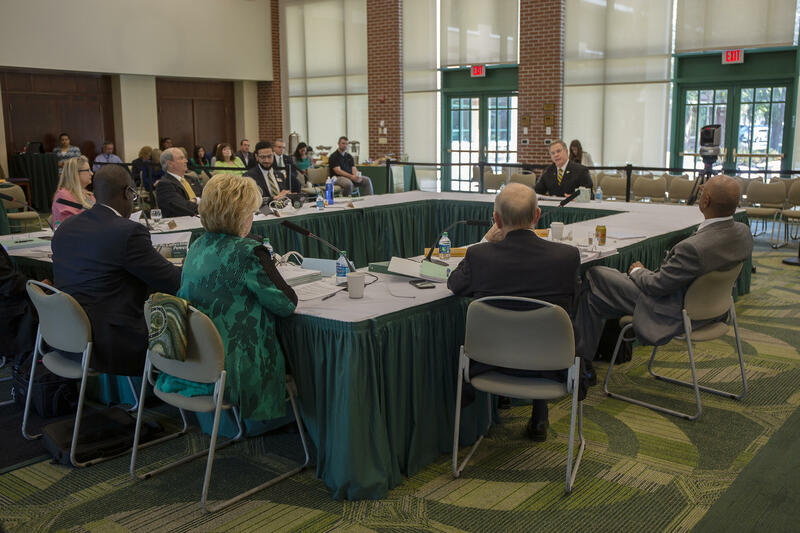 The University of South Florida Board of Trustees have selected Steven Currall as the next System president. Currall, 60, is the Provost/Vice President for Academic Affairs at Southern Methodist University in Texas. A majority of the trustees had Currall as their choice during a preliminary conversation after hearing from the four finalists earlier today. By the time the formal vote came, the board unanimously approved Currall. 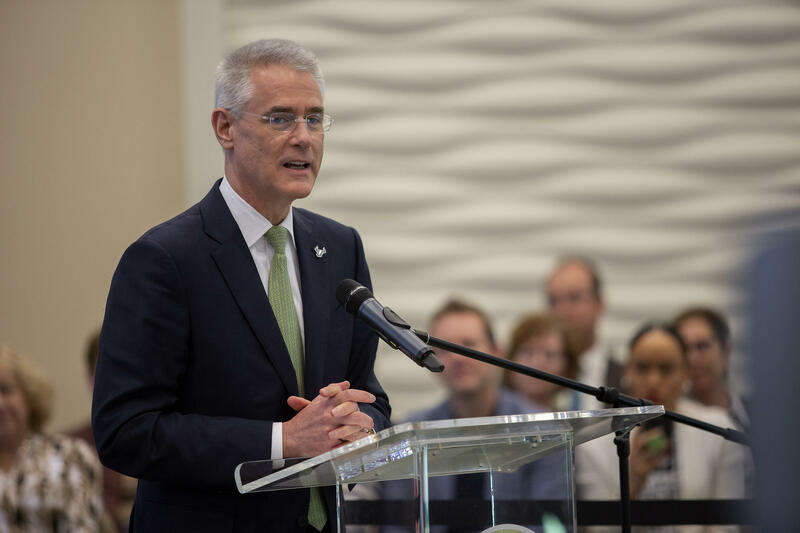 “It was clear to me, that as (we) went through the process that we knew we had the right leader, someone that could continue the trajectory that we have right now at the University of South Florida," said Board Chair Brian Lamb. If approved by the state Board of Governors next week, Currall will replace Judy Genshaft, who is retiring July 1 after a 19-year tenure at USF. “Big shoes, amazing legacy that President Genshaft has created here, and lots of momentum,” said Currall. “I just hope that we can continue that and maybe even increase the upward slope of that trajectory as well to take the university to even greater heights." Currall has been Provost and Vice President for Academic Affairs at SMU since 2016. He oversees all academic activities, helps manage the university’s budget and has led a campus-wide strategic planning process. That experience will come in handy as he joins USF, which is in the process of the consolidation and re-accreditation of its three campuses. "We're going to use it to reflect further on how we can be even stronger academically as a university,” said Currall. “I think it's a great opportunity for the three campuses to work in synergy and collaboration, so I'm looking forward to working with my colleagues on how to organize ourselves into an even great university." Currall was picked over finalists Wanda Blanchett, Interim Provost/Executive Vice Chancellor for Academic Affairs, Rutgers University – New Brunswick; Debasish "Deba" Dutta, former Chancellor at Rutgers University – New Brunswick; and Jeffrey Vitter, former Chancellor at the University of Mississippi, as well as almost thirty other people who applied for the job. “I’ve got a lot of background in both public and private universities and I’m very committed to student success and research visibility, global visibility of USF, so I’ll bring all those things to the conversation when I’m here in the position,” said Currall. Currall previously was dean of the graduate school of management at University of California, Davis, and the chancellor’s senior advisor for strategic projects and initiatives. UC Davis is a member of the Association of American Universities (AAU), a longtime goal of USF. Currall was also vice chair of the board for the University of California system’s Global Health Institute. He’s held leadership positions at University College London and worked at AAU institutions Rice University, the University of Chicago and Cornell University. Currall is expected to be offered a five-year contract. other benefits that USF employees receive, including health and life insurance. The hiring process isn’t complete yet. Currall’s appointment still requires approval by the Board of Governors, which oversees Florida’s 12 public universities. They will conduct a public interview and hold a confirmation vote on Thursday, Mar. 28, during their meeting in Tallahassee. In addition, Greenwood/Asher & Associates, the search firm that assisted USF in the process, still has to complete a thorough background check of Currall. Jan Greenwood said preliminary background checks of the four finalists didn’t show issues with any of them. She expects Currall’s deeper review will be complete by the time the Governors meet. Local leaders reacted to the news. St. Petersburg Mayor Rick Kriseman tweeted his congratulations, saying he looks forward to advocating for USF St. Petersburg when he meets with Currall. Currall is a native of Kansas City, Missouri. He earned a PhD in organizational behavior from Cornell, a master’s degree in social psychology from the London School of Economics and Political Science and a bachelor’s degree in psychology from Baylor University. He’s married to Cheyenne Currall, PhD., vice president and executive advisor for global advancement at the University of Texas Southwestern Medical Center. Copyright 2019 WUSF Public Media - WUSF 89.7. To see more, visit WUSF Public Media - WUSF 89.7.